Financial tech or FinTech is taking off in a big way. There seems to be another new FinTech startup every other day that’s trying to make your financial life easier, sometimes even in ways that you didn’t even know possible. Curve is one of these companies that promises this with the Curve Card. I had already read a few reviews and wanted to give this a try for myself. I have not been paid to complete this Curve Card Review. But if you keep reading, you can get £5 credit for signing up with my referral code. Curve plans to revolutionize the way that you pay by combining all of your payment cards into one. One card and an app that is. Rather than needing to carry a wallet full of cards, you really can give your wallet a workout and reduce some of the extra bulk by carrying just one card. I’m not a huge card carrier anyway, if you don’t include loyalty cards that is. I have 3 bank cards. My current account, my fuel only credit card, and the joint account. People carry a lot more. It’s scary. Curve allows you to register all of your existing cards into the app (except American Express, Maestro, Diners Club, JCB or UnionPay) and allows you to select which card you’d like to use for using the physical card to pay. Curve Card Review : Why do we need another card? At first, I wondered why the card was necessary. We already have the likes of Apple Pay or Android Pay built into our smartphones, why would we need to add a card into that combination? Maybe it’s the limit of £30 imposed by contactless transactions. But Android Pay and Apple Pay allow you to use their systems to pay for goods greater than £30, so it can’t be that. Why would you need a card? While a lot of major retailers allow for these smartphone based payments, there are still outlets that don’t. Some that don’t provide contactless payments either. Enter Curve. As well as the convenience that your smartphone payment platform provides, curve also give you the backup of Chip & PIN and failing that, the old faithful magnetic stripe. Just in case. Since getting a new phone, I’m now aware that Samsung Pay has the ability to emulate the magnetic stripe… But my bank isn’t compatible yet. Boo Lloyds. Boo. Providing all goes according to plan, it’s not another card to add to your ever bulging wallet, it should be the only card you need in your wallet. I hope. I had read that my first purchase needed to be a chip and PIN payment. Simple enough. I was at the garage and needed fuel and decided that the Pay-at-Pump would be as good a place as any to lose my Curve virginity. Much like real life, there was some fumbling about and everything ended quickly with disappointment. My card was rejected. I reverted back to my original credit card, paid, filled up the car and went on my way. The second time there was an error on my part. In store at Tesco I needed to pay for goods totaling less than £30. Contactless was the answer. Wrong. Looking confused at its rejection and explaining that it was a new card to the checkout lady, she reminded me that some new cards needed to be used for the first time via chip and PIN. And there it was. This was the actual first time. It’s the one you tell your friends about. I was so excited, I wanted to try it again. After leaving the shop, I took some cash out from an ATM. There was a warning about fees, being a Mastercard I assuem, but no such fees occured. This could be a relationship that lasts! There’s something quite nice about getting an instant notification on my phone for all my purchases. The app categorises my spending habits fairly well, even if only to highlight that my life is pretty boring. There are extensive search facilities and you can filter transactions by the card used, amounts, date range, categories, and if you are a business user, you can search by currency and if a receipt has been added if it’s for business use. Being a little fussy, I’d quite like to see a graphical representation of spending in a pie chart or similar. I’m slowly getting to a point where I can see this being the only card I need. I have kept my originals in my wallet for now, but haven’t used them. So that’s a good sign. I’m getting used to spending on the Curve Card and the App. I know which card I’m going to spend on and usually select it while wandering around the shop or while queuing. This is a simple process of opening the app swiping left or right to find your desired card and tapping it to select. There’s very little that can go wrong… unless you accidentally use the wrong card. Time travel is not something that many people would associate with a new bank card, but Curve offers it. 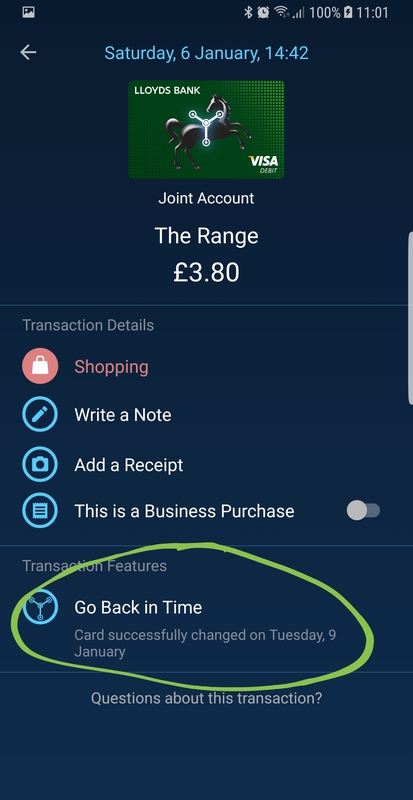 I’m not 100% on how it works, but there is a feature (with a cool flux capacitor logo) that allows you to go back in time and change the payment card that you’ve spent on. I have tried this for testing purposes only so far and it worked flawlessly. Checking a purchase made on my current account that should have been made on the joint account, I clicked into it and hit “Go Back in Time”. Chose the required card and it was done. The Curve Card allows you to change which account your spending comes from, after you’ve already spent it. Very clever stuff! Spending on this card in varying places gives you cashback in the form of curve reward points. Each 100 points equals one single earth pound. These points and any referral points end up on your curves rewards card. I’m led to believe that you can’t withdraw these rewards from a cash points, but you can select your rewards card in the Curve app and spend it anywhere else. As you can see below I have 500/£5 from a referral code I used when I signed up and 108/£1.08 from a purchase I made at Wilko. Blue (free) card holders get a 1.5% reward while paid members holding a black card get 3% cashback rewards at selected retailers. I also suggest adding your new Curve Card into Quidco for some extra in store cashback. I can’t confirm if it works yet, but I don’t see why not. Collect Curve Rewards as you spend in selected retailers and then spend the rewards as you please by selecting the rewards card in the app and spending as normal with your Curve Card. Allows more payment methods than just contactless. Cashback Reward Scheme when you use Curve at certain retailers. Time Travel – change the account that you’ve spent on… after you’ve spent it. Not (yet?) accepted as a payment method for Apple/Android/Samsung Pay. No graphical output of spending. CGWSX promo code gets you free £5 and jumps the 50,000 user waiting list, great card!